Catalyst the Brain Issue DVD Review Catalyst is one of the best science programmes on Australian television, and ‘The Brain Issue’ is a good example of that. The stories themselves are intriguing, and they do what they’re supposed to: They make you think, and encourage discussion about some tough subjects. The stories are taken from the ABC’s flagship science programme, Catalyst. 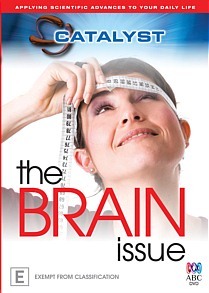 The DVD contains 8 separate stories relating to the functions, disorders and chemistry of the brain. It’s typical of a Catalyst production, in that the research is taken from emerging or cutting edge areas of science, and delivered by an eminently likeable cast of presenters who each come from a scientific background. The show’s presenters do a great job at breaking down complex issues and explaining them in a simple, direct way. You always feel as if you’re being spoken to one-on-one, which is a big part of the show’s appeal. Dr Paul Willis takes an unabashed and mature approach to breaking down the science of dating, while Dr Jonica Newby does a great job at explaining the psychology of Wall Street economics. On the down side, all of the material in ‘The Brain Issue’ has been seen on free-to-air television, meaning that if you’re a regular Catalyst viewer you’ll likely have watched it already. Then again it never hurts to brush up on your science, especially when it’s as interesting as what’s on offer here. Eight stories aren’t much to fill a DVD with, when you consider that each only runs for around 10 minutes, and there are no special features to add value. As great as the reporting is, you can’t help feeling that the package is missing a few extras to make it worth purchasing. Catalyst is one of the best science programmes on Australian television, and ‘The Brain Issue’ is a good example of that. The stories themselves are intriguing, and they do what they’re supposed to: They make you think, and encourage discussion about some tough subjects. If you feel the need to tweak your hippocampus with some great science reporting, ‘The Brain Issue’ should do the trick. It’s just missing a few extras that could have released that extra burst of dopamine, and made it truly worth the while.